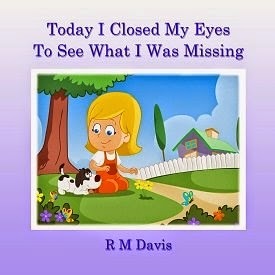 Today we are interviewing R M Davis, author of the children's book Today I Closed My Eyes To See What I Was Missing. A story for young readers, inspiring adventure and discovery, and encouraging awareness, acceptance, and the courage to be one's self. Children. Young readers between 4 and 8 years old. What inspired you to write a children’s picture book about adventure and discovery? Love to see children explore and discover. What lessons can children learn from the story? To be more accepting, to be more aware of their environment, to be kind. Is there an author who has influenced your storytelling style? Not an author. My grandmother was an amazing story teller. She was always descriptive and engaging. More children’s books encouraging awareness and character. The book encourages dialog between children and parents.